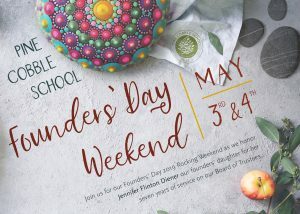 Join us for our Founders’ Day 2019 Rocking Weekend (May 3-4) as we celebrate 82 years of this extraordinary school and honor one of the founders’ children, Jennifer Flinton Diener. Not only is Founders’ Day a time when we can kick up our heels and have a good time, it is also the school’s biggest fundraising event, with all proceeds supporting our financial aid program. The Friday night celebration will feature hearty hors d’oeuvres, cocktails, moving messages from a current student and our founders’ daughter! Saturday night will be dancing in the barn and a silent and live auction with some amazing items up for bid. You won’t want to miss inspiring words from one of our alums who will share the impact Pine Cobble has had on her life. And we can’t forget about the tasty food and signature drinks.